valuation and surveying technology market. Over the last decade eTech has established itself as a leading supplier of mobile surveying and workflow management software. 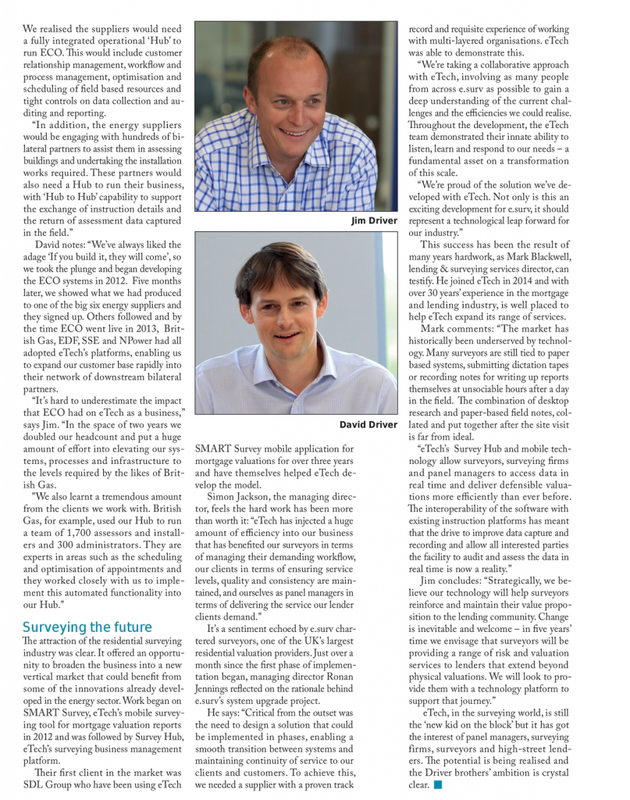 The business is the provider of choice for domestic energy assessments and regulatory reporting, and for the last three years eTech has focused its sights on delivering a new technology platform for the valuations and surveying industry. “It’s taken significant investment and hard work to get to this point in the surveying market and it’s great to see our systems up and running with SDL Group and e.surv,” says David Driver, one half of the two brothers that own the business. With a number of implementations in the pipeline for this year, momentum is building, but eTech’s progress in the valuation and survey market is no overnight success. Based in Solihull, eTech employs 150 people and features in the Sunday Times’ Tech Track list of the UK’s 100 fastest growing privately owned technology businesses. 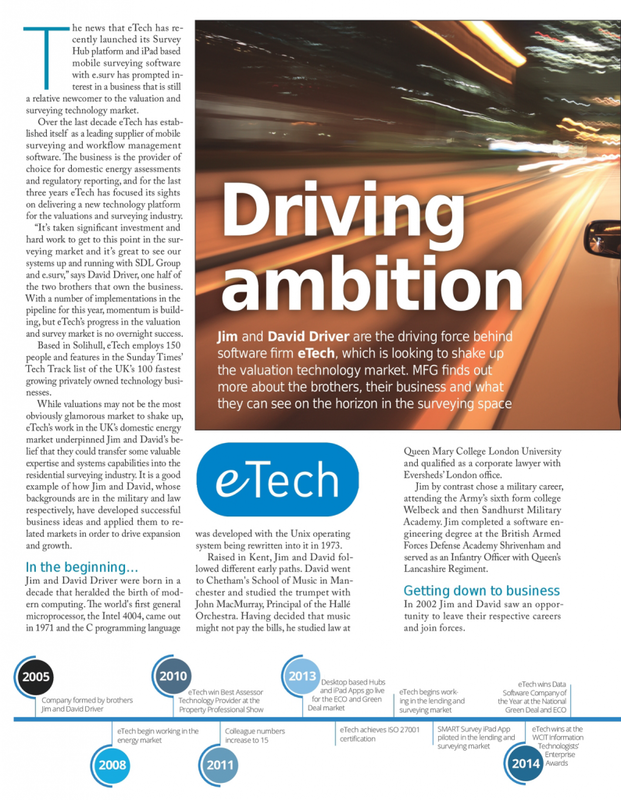 While valuations may not be the most obviously glamorous market to shake up, eTech’s work in the UK’s domestic energy market underpinned Jim and David’s belief that they could transfer some valuable expertise and systems capabilities into the residential surveying industry. It is a good example of how Jim and David, whose backgrounds are in the military and law respectively, have developed successful business ideas and applied them to related markets in order to drive expansion and growth . Jim and David Driver were born in a decade that heralded the birth of modern computing. The world’s first general microprocessor, the Intel4004, came out in 1971 and the C programming language was developed with the Unix operating system being rewritten into it in 1973. Raised in Kent, Jim and David followed different early paths. David went to Chetham’s School of Music in Manchester and studied the trumpet with John MacMurray, Principal of the Halle Orchestra. Having decided that music might not pay the bills, he studied law at Queen Mary College London University and qualified as a corporate lawyer with Eversheds’ London office. Armed Forces Defence Academy Shrivenham and served as an Infantry Officer with Queen’s Lancashire Regiment. In 2002 Jim and David saw an opportunity to leave their respective careers and join forces. Jim and David’s first move was to buy a domestic security business in 2003 with a national customer base. Located in the Midlands, the business needed major modernisation. “It was our first technology project- we brought in early stage mobile working software and route planning which had a dramatic impact on the business,” says Jim. The project sparked the brothers’ interest in deploying technology to improve logistical and operational performance for field base businesses in the residential property sector, and this has remained a focus ever since. In 2003 Jim and David spotted an opportunity to build a new business to help major retailers comply with their obligations under the Disability Discrimination Act (DDA) .The DDA required retailers to make adjustments to their buildings and services to remove barrier to access for disabled people. The new business, Configure, provided consultancy and building access audits to the likes of Greggs Bakers, Ottakar’s, Matalan and Travel Lodge. Jim explains: “Configure was undertaking hundreds of building access surveys across the UK. PDA-based mobile surveying platform. It was ground breaking stuff back then and one of the guys, Craig Mellon, turned out to be a real talent, enabling us to make rapid progress in developing the software.” Craig now heads eTech’s 50 strong development team. business in 2005. As with t he DDA, new legislation requiring the production of Energy Performance Certificates for domestic properties provided an opportunity for rapid growth. eTech quickly established itself as the leading technology provider for the energy assessment market, enabling over 3,000 domestic energy assessors to receive and manage EPC instructions and to produce the EPCs, lettings inventories and floor plans on a mobile device. 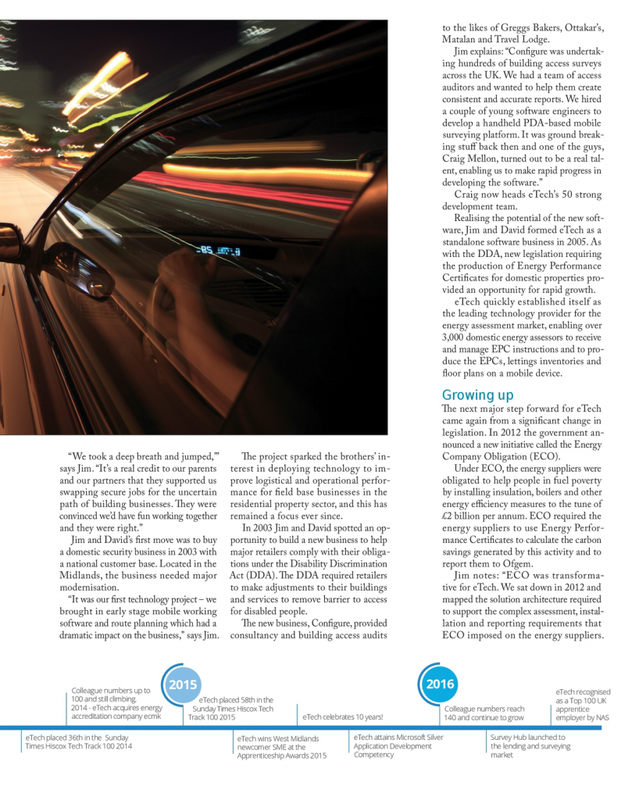 The next major step forward for eTech came again from a significant change in legislation. In 2012 the government announced a new initiative called the Energy Company Obligation (ECO). Under ECO, the energy suppliers were obligated to help people in fuel poverty by installing insulation, boilers and other energy efficiency measures to the tune of £2 billion per annum. ECO required the energy suppliers to use Energy Performance Certificates to calculate the carbon savings generated by this activity and to report them to Ofgem. Jim notes: “ECO was transformative for eTech. We sat down in 2012 and mapped the solution architecture required to support the complex assessment, installation and reporting requirements that ECO imposed on the energy suppliers. We realised the suppliers would need a fully integrated operational ‘Hub’ to run ECO. This would include customer relationship management, workflow and process management, optimisation and scheduling of field based resources and tight controls on data collection and auditing and reporting. David notes: “We’ve always liked the adage ‘If you build it, they will come’, so we took the plunge and began developing the ECO systems in 2012. Five months later, we showed what we had produced to one of the big six energy suppliers and they signed up. Others followed and by the time ECO went live in 2013, British Gas, EDF, SSE and NPower had all adopted eTech’s platforms, enabling us to expand our customer base rapidly into their network of downstream bilateral partners. “It’s hard to underestimate the impact that ECO had on eTech as a business,” says Jim. “In the space of two years we doubled our headcount and put a huge amount of effort into elevating our systems, processes and infrastructure to the levels required by the likes of British Gas. The attraction of the residential surveying industry was clear. It offered an opportunity to broaden the business into a new vertical market that could benefit from some of the innovations already developed in the energy sector. Work began on SMART Survey, eTech’s mobile surveying tool for mortgage valuation reports in 2012 and was followed by Survey Hub, eTech’s surveying business management platform. Their first client in the market was SDL Group who have been using eTech SMART Survey mobile application for mortgage valuations for over three years and have themselves helped eTech develop the model. It’s a sentiment echoed by e.surv chartered surveyors, one of the UK’s largest residential valuation providers. Just over a month since the first phase of implementation began, managing director Ronan Jennings reflected on the rationale behind e.surv’s system upgrade project. He says: “Critical from the outset was the need to design a solution that could be implemented in phases, enabling a smooth transition between systems and maintaining continuity of service to our clients and customers .To achieve this, we needed a supplier with a proven track record and requisite experience of working with multi-layered organisations. eTech was able to demonstrate this. “We’re taking a collaborative approach with eTech, involving as many people from across e.surv as possible to gain a deep understanding of the current challenges and the efficiencies we could realise. Throughout the development, the eTech team demonstrated their innate ability to listen, learn and respond to our needs – a fundamental asset on a transformation of this scale. This success has been the result of many years hardwork, as Mark Blackwell, lending & surveying services director, can testify. He joined eTech in 2014 and with over 30 years’ experience in the mortgage and lending industry, is well placed to help eTech expand its range of services. Mark comments: “The market has historically been underserved by technology. Many surveyors are still tied to paper based systems, submitting dictation tapes or recording notes for writing up reports themselves at unsociable hours after a day in the field. The combination of desktop research and paper-based field notes, collated and put together after the site visit is far from ideal. eTech, in the surveying world, is still the ‘new kid on the block’ but it has got the interest of panel managers, surveying firms, surveyors and high-street lenders. The potential is being realised and the Driver brothers’ ambition is crystal clear.